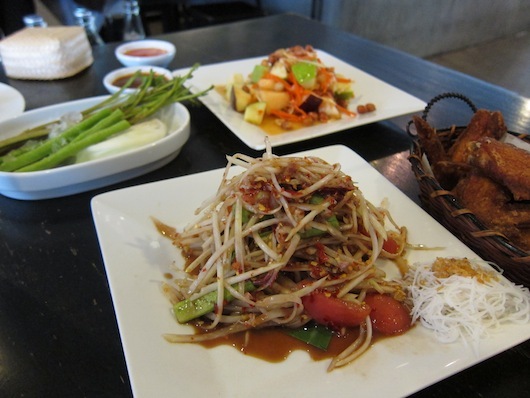 Baan Somtum on Soi Si Wiang in Sathorn produces 22 varieties of som tam along with a host of other Isaan soups and salads in a modern atmosphere. You pay a little extra for the air-con spread and snappy team of servers, but when it comes to northeastern Thai flavours, Baan Somtum isn’t playing around. 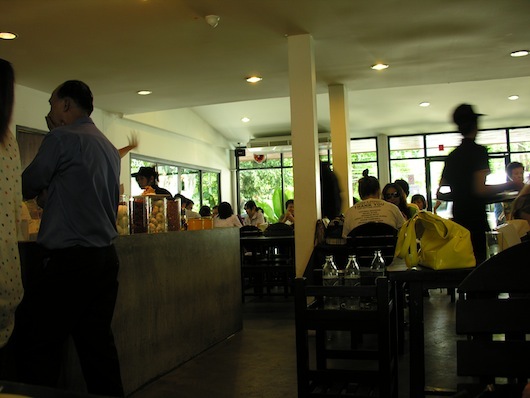 Situated along a quiet street lined with trees in an upmarket area of Sathorn, Baan Somtum fills up with Bangkok business types for lunch and dinner (especially on weekdays), and it can get noisy during peak hours. Black tables and chairs, huge glass windows in front and back, and polished concrete floors make for a cool, minimalist vibe. The only signs that this is an Isaan food joint are the head-sized jars filled with ingredients like lime, chilli and garlic, and framed photos of northeastern Thai dishes hung on clean white walls. Apart from an exhausting 22 varieties of som tam that include the ubiquitous green papaya salad’s spicy, salty, sour and sweet flavours along with, for example, four different types of crab, pork skin or preserved salty eggs, an extensive menu also features a deep-fried laap salad, golden fried fish and chicken, and a handful of deep-fried veggie specialties like crispy pak wan, a leafy vegetable that grows wild in some parts of Thailand. Don’t forget to sift all the way to the back end of the menu, where Baan Somtum’s Isaan soups will leave you struggling to make a decision. 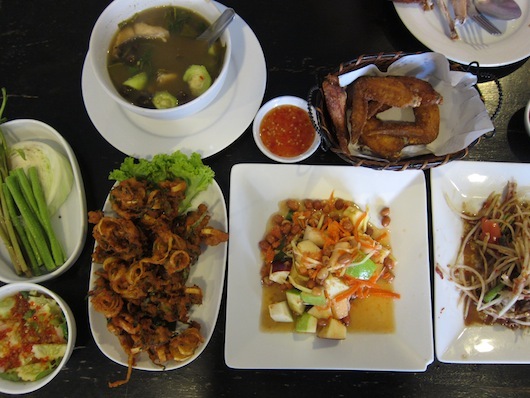 The menu is only in Thai, which comes as a bit of a surprise for a place like this, but a host of pictures make it possible for non-Thai readers to make a go of it. Som tam foodscape -- buu pla raa in the forehand with tam ponlamai lingering behind. When you do decide, don’t forget to order khao niew (sticky rice) to help ease the true-to-Isaan spiciness that leaps from most of the salads. Our som tam puu pla raa was fiery, and fried chicken wings were a worthy (albeit messy) compliment. A huewak lee banana blossom salad lightly fried with kaffir lime leaf and served with mildly spiced cucumber salad did well as an accompaniment. All of the above were good, but the highlight of our meal was a gaeng hed pawk soup that featured rare hed pawk mushrooms dug from the hills of Isaan along with slices of fresh white fish and green Asian zucchini bathed in a dark, spicy and tart broth of roasted chilli, lemongrass, turmeric, basil, kaffir lime leaf and fresh lime. All these tastes mingled together but didn’t overpower the complex mushrooms. Reminiscent of truffles with their spongy outside texture surrounding an earthy middle, they made the meal, especially since the soup came with many a mushroom-y mouthful. Our playing field of spice. As a close to the meal we tried tam ponlamai, a som tam-style salad with sliced fresh melon and apple in place of the usual shredded green papaya, roasted peanuts, and a sauce that’s more on the sweet side of the spectrum. There wasn’t a whole lot to it, but it was a refreshing bite after the soup and pungent som tam buu pla raa. Next time we’ll try one of their Thai sweets like the bouncy black jelly of chow khival. To get here, take exit #1 out of the Surasak BTS station, U-turn at the bottom of the stairs and take the first right on to Thanon Surasak. After a short walk take another right on to Soi Wa Wiang, and Baan Somtum isn’t far, tucked off the street on the right. Prices range from 45 to 100 baht for most dishes — very reasonable compared to comparable modern-cosmopolitan style Isaan restaurants in Bangkok. If Baan Somtum is full, or if you want to compare it to the streetside experience, a street restaurant serving similar Isaan fare is just a bit further down Soi Wa Wiang, although there’s no English or pictured menu here so you’ll first need to have an idea of what you’re looking for.